Cockpit Features: seats one, has poor visibility, no creature comforts. For example, the Beast has no radio, air conditioning, heater, glove box, padded and adjustable seats, sun visor, mirrors, cigarette lighter, ash tray, windshield wipers, air bags, defroster, headlights, or turn signals, BUT IT GOES FAST! C - Main Parachute: when this lever is pulled straight back, the afterburner fuel and main engine fuel pumps will be shut off and one of the 16 foot parachutes will be deployed. 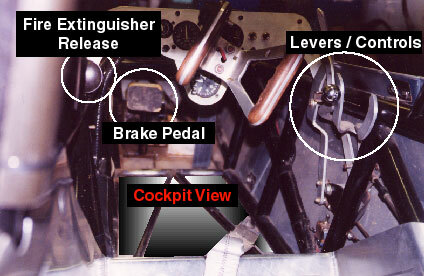 D - Secondary Parachute and Fuel Shut-off: when this lever is pulled straight back, the valve between the fuel tank and fuel pump closes and the secondary parachute is deployed. A - Main Engine Fuel Control: used to start and bring engine to full operating RPM. 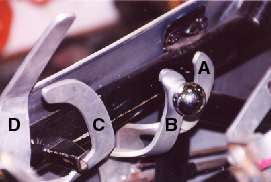 B - Afterburner Lever: schedules fuel into the tail pipe or afterburner; this will double horsepower or engine thrust.